The new theatre featured national touring companies fresh from Broadway with such hits as “Uncle Tom’s Cabin”, “The Soul Kiss”, “Beverly”, and “The Red Mill”. The Bradley also featured silent films complete with piano accompaniment until 1928 when the first talkie was presented. The movie “Buffalo Bill’s and Pawnee Bill’s Wild West and Far East Show” featured Buffalo Bill in his final public appearance. During 1911 the theatre featured several benefit nights in order to raise money for the newly developed fire departrment in Putnam. On one of these evenings an audience of 1,095 people had raised a donation of $54.75. The Bradley has undergone a number of changes in its 98-year history. In 1914 the theatre was the site of two fires just 14 hours apart causing over $40,000 in damages. After the fires, the interior of the theatre was rebuilt with increased showing of movies beginning to influence the interior of the theatre. The thrust of the stage was removed and a set of stairs installed. The orchestra pit was covered over and the balcony remodeled. The theatre has gone by various names through its history. Postcards announcing the opening of “The Old Homestead” in 1922 refer to the Putnam Opera House. In 1927 Morris Pouzzner from Boston reorganized, remodeled, and renovated Putnam Theatres Inc. According to the Putnam Patriot, “Superlatives are needed to describe the remodeled playhouse … from roof to cellar nothing has been neglected that could give comfort and pleasure”. Seating was replaced and reduced to provide more room for each patron. Improvements included a widened lobby and replacement of the restrooms, ventilation system, stage rewiring, lighting, emergency exits, hangings, chandelier and pipe organ. On December 9, 1937 a short circuit caused a fire in a dressing room which soon became an enormous blaze. Fortunately for the theatre a specially designed asbestos curtain dropped containing the fire to the stage area. It was noted at the time that of all the curtains so designed only three had functioned as intended when fire struck. The theatre sustained $30,000 in damages including the loss of all scenery, properties and “talking picture apparatus”. Soon crews under the direction of district manager James Mahoney were hard at work making repairs and additional improvements. The most noticeable improvement was the new “Bradley” marquee which lit up the street corner, extending over the sidewalk. Seventy seats were installed as the organ and ventilation ducts as well as the orchestra pit were removed. The rugs, seats and furnishings, heating and air conditioning systems were again replaced. And a “mirror phonic sound reproducer” was installed. On Christmas Day the theatre reopened on schedule with the first of a series of first run pictures, which included: “Thoroughbreds Don’t Cry”, “Rosalie”, with Nelson Eddy, and “Nothing Sacred” with Frederick March and Carole Lombard. In 1953 the concession counter was moved from inside the theatre auditorium to its present location and further renovations were made. Movies continued to be shown at the theatre, now know as the Imperial until 1985. In 1984, a group of community members and leaders of the arts banned together to form the Northeast Repertory Theatre, bringing live theatre back to the Bradley and Northeastern Connecticut. The group staged productions of “Same Time Next Year”, “Carnival”, “Pump Boys and Dinettes” and many others. 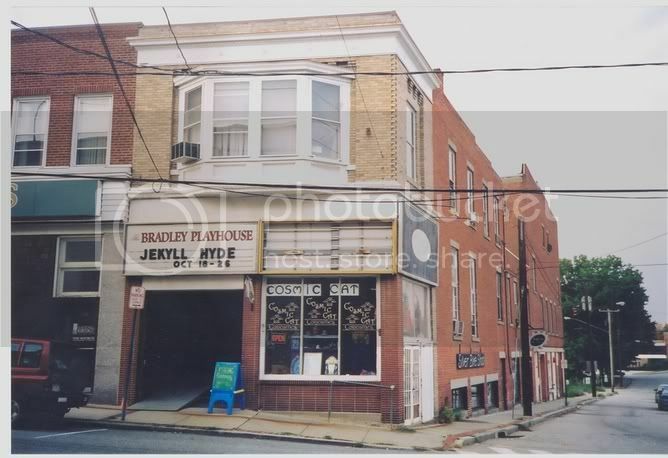 In 1988 the group changed its name to the Bradley Playhouse Association and the theatre continued to change and grow. 1989 saw the presentation of a Winter Festival. And in 1990 the summer children’s acting workshop was added to the season’s events. The current theatre group, incorporated in 1991 as the Theatre of Northeastern Connecticut at the Bradley Playhouse, gained non-profit status in 1992. I found references to a “Victory Theatre” in Putnam in 1948. But it was suggested that this was probably a (temporary) renaming of the Bradley. Changing the name of a theatre to “Victory” was a common practice after World War II. I went to a show at the Bradley Playhouse yesterday. It was a musical-comedy-review entitled Broadway Live…Christmas put on by the Theatre of Northeastern Connecticut, which occupies the house and does many shows throughout the year, and while the show was not my cup of tea, the audience at the sold-out performance was having a grand time. Besides a chance to see one of the many reasonably-priced shows here, many might have come to see friends and relatives and many children in the cast comprised of locals. The atmosphere is very friendly and community-oriented. The staff is particularly pleasant and accomodating. I walked all about the theatre before the show and during intermission to check out various parts of this wonderful old 1901 theatre. It served as a movie house for many decades, and the projection booth structure is still intact, though movies haven’t been shown here in close to three decades. I couldn’t help wondering as I sat there and as I roamed and took a few photos, that this is what every small-town former movie theatre in American might have become instead of facing destruction. My thoughts went to the recently-demolished Pastime Theatre in Bristol, RI. Preservationists were unable to get the town to save it, and so Bristol, which might have had the likes of a Bradley, will be doomed not to. In recent years the town of Putnam has become a Mecca for its antique shops which have brought new life to the place and given it a new identity. How much of that has been instrumental in keeping the Bradley alive is hard to say, but it certainly hasn’t hurt. Let’s just be thankful and hope that this gem of an old house will continue to survive and succeed. I was on a bike trip the last few days and passed by this place yesterday. Cute. Turns out they are under construction and will be open shortly. When you call, the answering machine just says hi and that’s it. There’s a store on the corner as part of the building called “The Cosmic Cat” (tarot, etc) and you can access it from the lobby. Interstate of New England has resumed late foreign film showings at the Bradley, Putnam. A single import is screened at about 10 p.m. on Friday nights, at 90 cents top. Regular U.S. product is shown earlier in the evening and remainder of the week. Just before the engagement of “Forever Amber” at the Bradley in Putnam, clergy of St Mary’s Parish there attacked the picture and urged parishioners not to attend it. In the 1942-43 edition of the Motion Picture Almanac, the Bradley Theatre in Putnam is listed under the Interstate Theatre Corp. of Boston. The list also includes the Victory Theatre in Putnam. A post above suggests that the Putnam and the Victory were one in the same. At the time, Interstate Theatres also ran the Palace in Rockville and the Orpheum and the Majestic in Danielson CT. I think the Victory was a separate theatre from the Bradley. There’s a picture of it at http://i.ebayimg.com/00/s/NTU3WDg0NA==/z/mq0AAMXQAx9RS1CQ/$T2eC16V,!%29QE9s3HFf3cBRS1CQ,je!~~60_57.JPG and while I can’t see the theatre clearly, the address says Main Street whereas the Bradley is on Front Street. As a boy back in the fifties, I, somehow was granted access to the 2nd floor of the building known as the Union block building on Main St in Putnam, Ct. The first floor was occupied by a bakery, tavern, hardware store and newspaper. There was a large staircase leading to the dusty and unoccupied 2nd floor. I saw a large room with a stage which definitely hadn’t been used for a many years. I felt then that I was walking back in time and that I was being granted a truly special opportunity. I found a an admission ticket labeled “Victory Theater”. I had never met anyone who had ever mentioned this theater. But I believe it was a combination theater and meeting or dance hall. Does anyone else know anything about this Victory Theater ?